The Electron of September delivered today showed the Dutch VERON DX Honor Roll per July 2013. 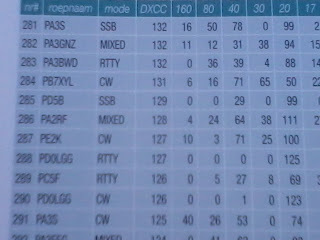 I found myself on position 286 of the list with 128 different DXCC's. Not that bad for a modest set-up I use and the time I spend on making HF QSO's. I started about 8 years ago on shortwave with a tube (2x 6164) rig TS515, then switched to a TS130 and last 3 years I use a Yaesu FT450. Also contacts with QRP homemade equipment were made. Most of the time with a simple G5RV jr antenna (2 x 7.75 m) over the roof of my house. I started to make lots of digimode contacts (PSK31 in particular). 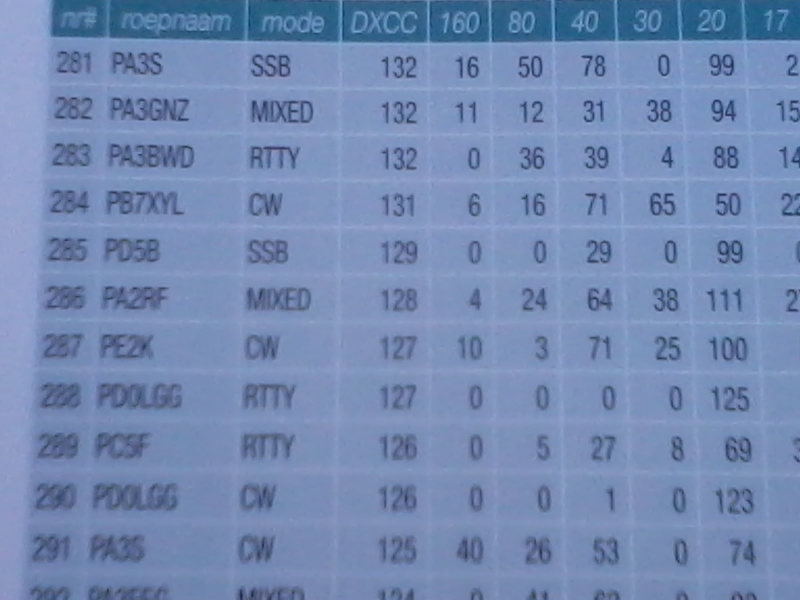 During contests SSB and RTTY are the most used modes. It is amazing to see that nr 1 till nr. 21 of the list all worked 340 DXCC's. 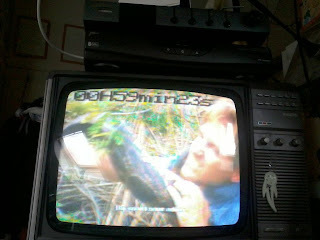 The FT450 (without internal antenna tuner) that I use nowadays. Almost all of the time with less than 20 Watts RF. While waiting for the CLY15 to arrive, today I started with the PA for 1.2 GHz. Used a simple unetched PCB to cut-out the striplines. Decided to use SMA connectors instead of BNC. 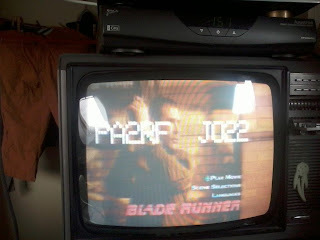 BNC runs appr. 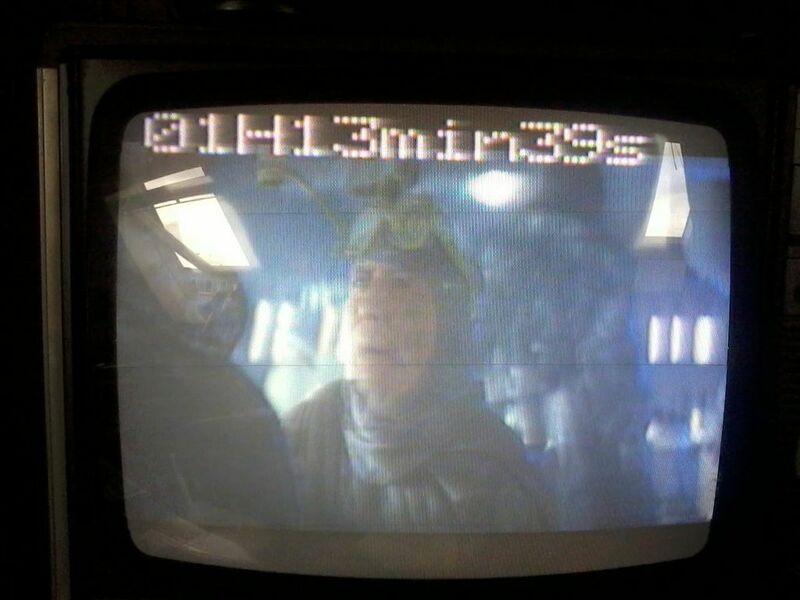 until 1 GHz. 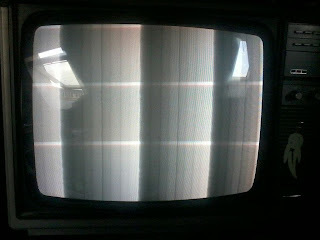 In the back you see the 1-channel 1.2 GHz video module that provides 100 mW. I would like to do some ATV trials in the 23 cm band. For this purpose I have a small ATV module that transmits on 1256 MHz with appr. 100 mW. This is not enough to reach the local ATV repeater PI6ZTM. Therefore I am looking for a PA to boost the 100 mW signal. 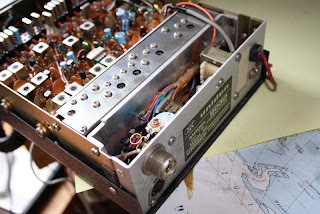 Lately I discovered the CLY15 GaAsFET. This FET is often used in GSM and WiFi equipment and is manufactured in large quantities. It is able to produce appr. 2 Watts up till 2.4 GHz. It's very small (SOT223 housing). Power supply voltage is max. 6 Vdc. I found that it requires a negative Gate Source voltage to operate. Because this type of FET is so cheap ($2), I ordered 2 of them at eBay for some trials. If less power is required, the CLY5 or CLY10 can be a better choice. 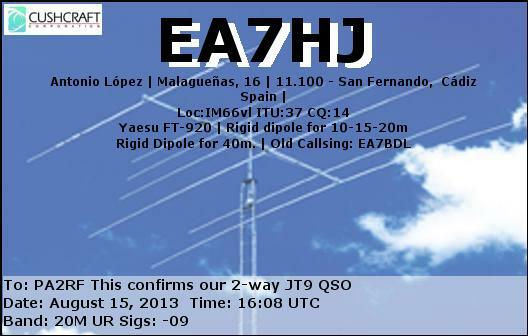 Just received a nice eQSL from the UK. On 40m I made a SSB QSO with Callum, August 17. He received my 15 Watts signal with 55. 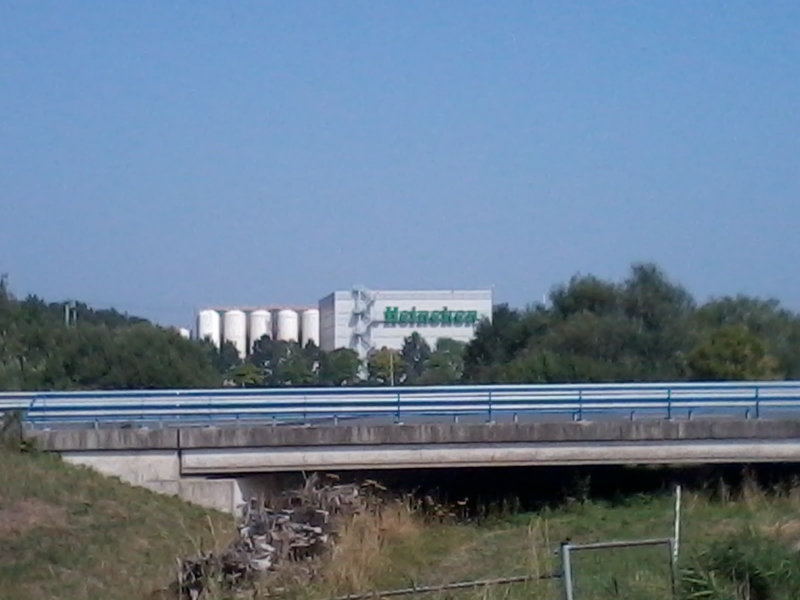 His signal was much stronger in Zoetermeer. Nice picture of Birmingham by night ! 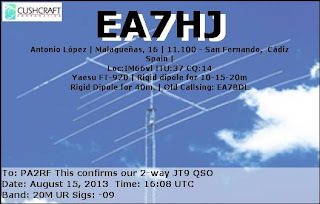 Wished all eQSL-users had their own pictures on the cards. Fair propagation this afternoon on 28 MHz. Adjusted my FT450 to 28.12460 MHz this afternoon and set TX frequency in WSPR software to 28.126130 MHz. 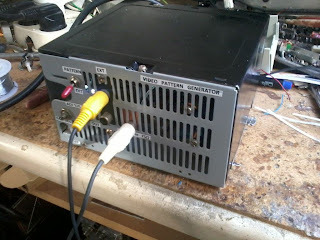 RF Output power was 5 Watt into G5RV junior antenna . Today was a good day for out-of-the-house activities. Expected temperatures about 25 degrees Celsius, attic radioshack temperatures similar or even higher. 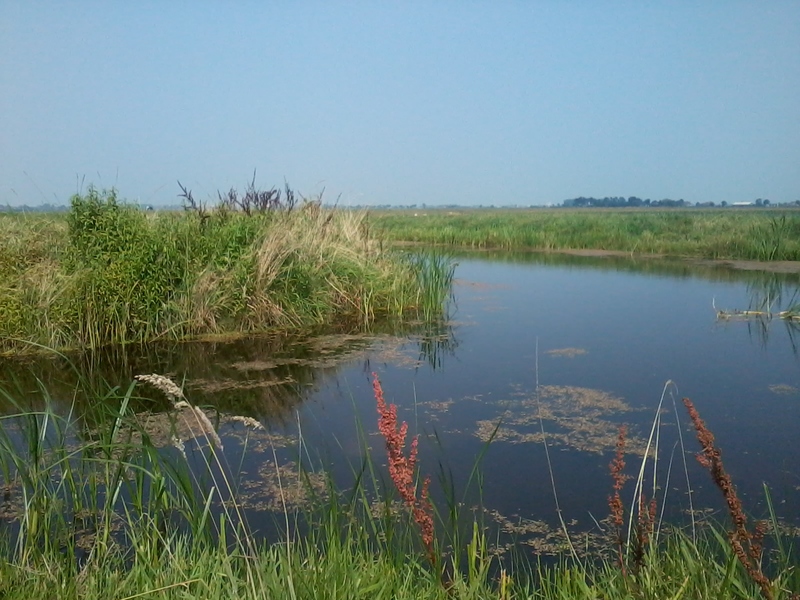 I decided to enjoy the nice weather by grabbing my bicycle and make a nice trip into "Het groene hart" ("The green heart"). Finally it turned out to be a ride of appr. 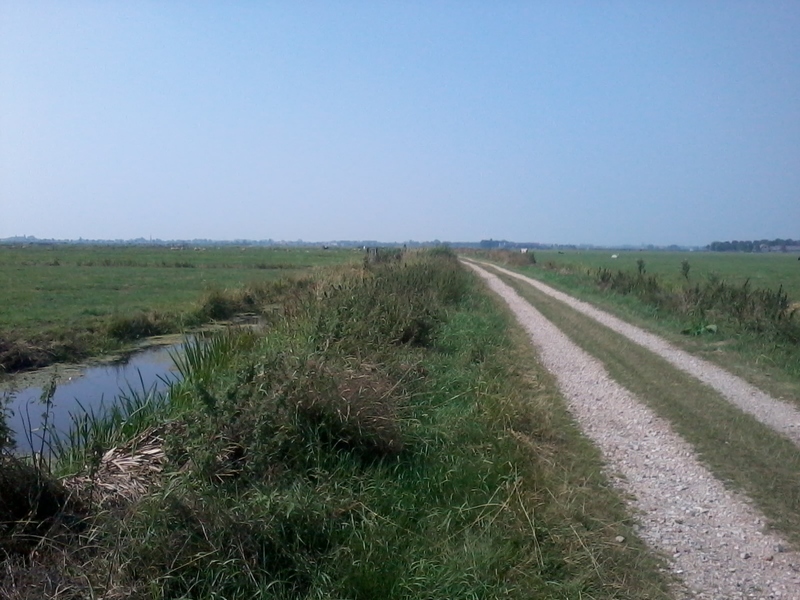 29 km. Of course I took with me some radio equipment: A JingTong 2m porto with 2 Watts output. Even about 15 km from my QTH Zoetermeer, I was able to make contact with the local repeater on 145.750 MHz, FM. I had two nice chats with Jack, PA7RJ. I found out that the JingTong porto works fine after not being used for allmost one year and 2 Watts is enough for smalltalk. 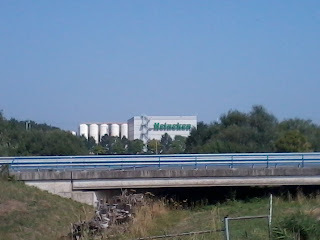 Switched on the app "MyTracks" on my smartphone (Samsung Galaxy Y) to record my track using the GPS satellites. It makes a nice track on Google maps as you can see in the picture above. I really recommend this app. Quiet area in the "Randstad "
Yesterday I went for a quick fix to incorporate my own text in the PIC12F683 of the pico OSD. Used the hex editor WinPic800 to change existing text to new text. I am considering to download Microchip's development environment MPLAB IDE and a trial version of Hi-Techs C-compiler for small PICs to try some real programming. Four 2K Eeprom PICs 12F683 have already been ordered from eBay (total of $3.00 incl. shipping from China :-) ). Hope to do some testing coming weekend with a small ATV transmitter (100 mW) and biquad antenna. Coming period I won't have much time for the hobby since the end of my holiday is approaching and the QRL starts to pull. I finished the video switch/pattern generator. This box enables me to select (2) external inputs or a test pattern bar and make the signal available on the cinch output bus. On top of the external video signals, the pico OSD superimposes the elapsed time. 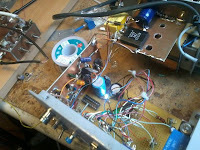 Since the "LF" part is more or less finished, now I am ready to start with the RF part of the ATV 1.2 GHz transmitter. Still one wish: Reprogramming the PIC 12F683 to make my callsign and QTH locator visible below the elapsed time of the pico OSD. I have to study " C " language and find a suitable C-compiler to do this. circuit that can do that. I found the PicoOSD (" Overlay Superimposer Device "). 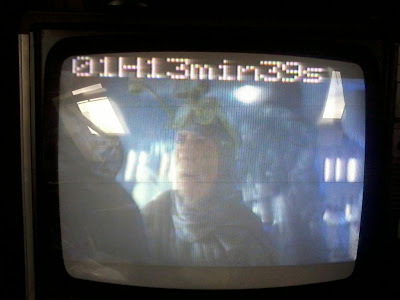 (like text and clock info ) over an existing PAL composite video picture. 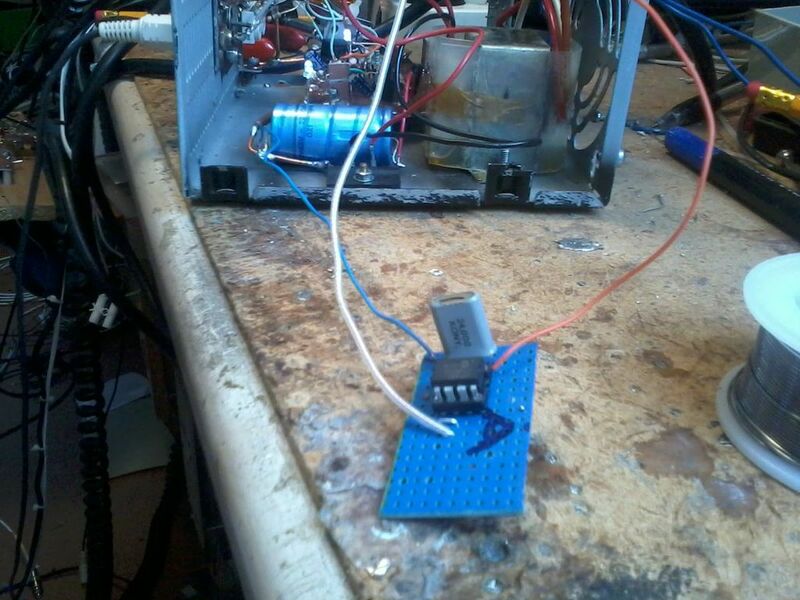 I built the experimental circuit (which is only the pic, 25 MHz xtal and 2 15 pF capacitors) on a breadboard. After programming the 12F683 the circuit worked immediately. 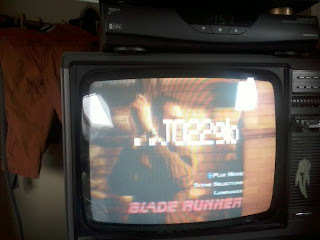 In the picture you see on top of the screen the elapsed time info. This is what the pico-osd does. The clock info on top of the screen comes from the pico OSD. I am impressed! Now the real challenge comes with reprogramming the source code in order to make my callsign and QTH locator visible. Not so easy since the program is written in " C ". 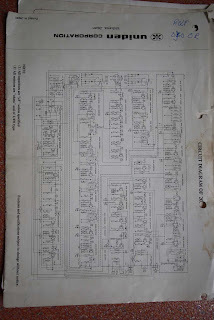 the small circuit into the existing video switch/pattern generator. Compliments to Bruno Gavand who develloped this project. Amazing what a 50 cents PIC can do for you ! Just made a nice QSO with Richard, GB2LK from Scotland on 7187 kHz. This is a lighthouse station in the south-west of Scotland. Richard used a wire antenna and had 200 Watts in the air while I was using 25 Watts from my Yaesu set. He received my small radiosignal with S57. 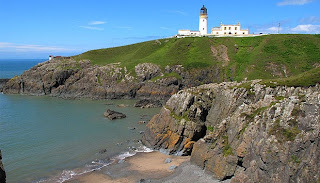 Nr Portpatrick, Dumfries & Galloway, SW Scotland. Since it is the International Lighthouse-Lightship weekend there is a lot of activity from stations located on the lighthouses/ships. This must be one of the simplest video pattern generators one can realize. 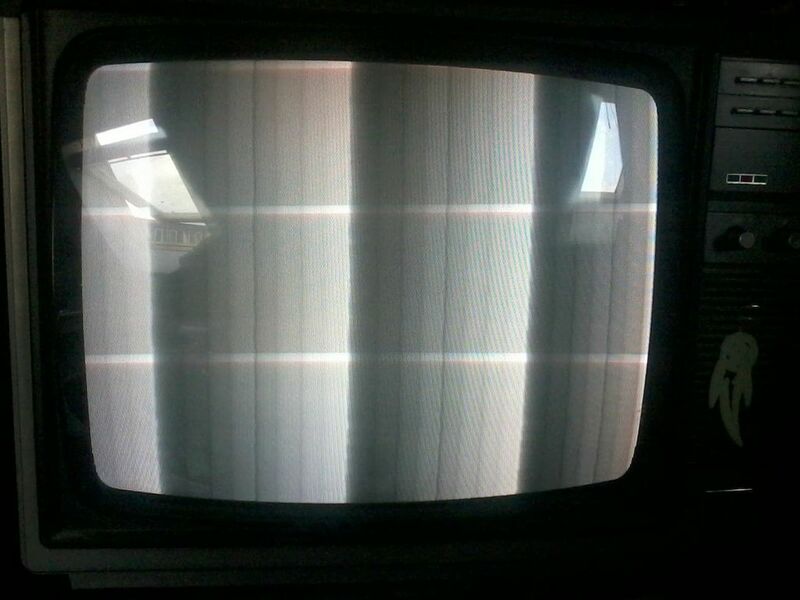 It provides a black/white bar pattern. 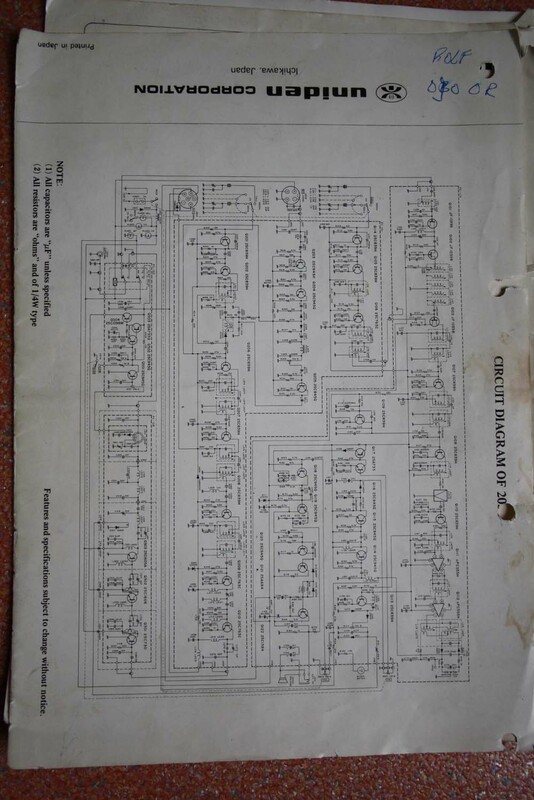 The circuit is designed around a 1$ 4060. This is a 14 bit counter. A steps shaped block wave is created by adding the 3 output signals (contacts 4, 5 and 7) in the proper proportions. The output signal can be adjusted to the required 1 Volt peak-peak. Contact 4 (Q5) provides a f:64 signal. 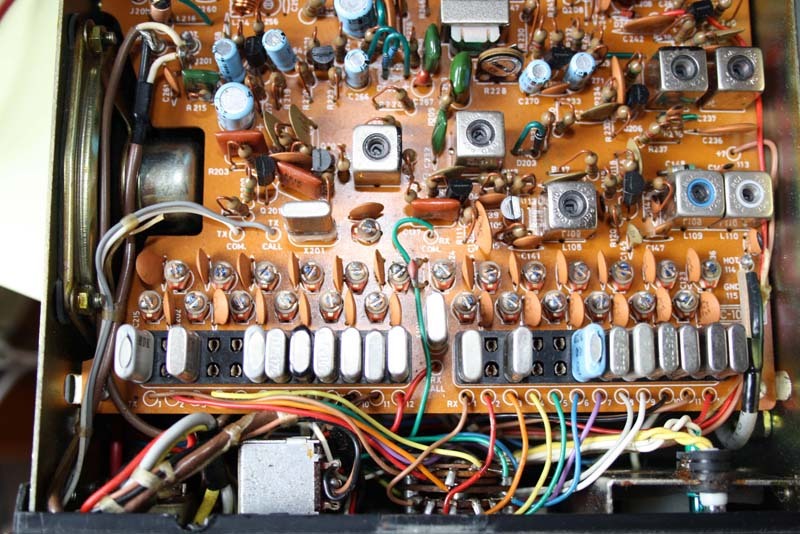 When the Xtal is choosen as 1 MHz, output Q5 delivers a 15,625 Hz signal. This is what is required for the 64 us synchronization pulse (0 V). 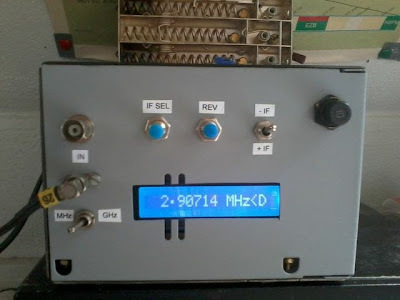 I did trials with various Xtal frequencies and 4.43.. MHz provide three main bars each consisting of 8 subbars. I presented this signal to a small QRP ATV 1.2 GHz transmitter and when received by an analogue satellite tuner, the picture above was seen on my TV. If you know how a simpler video generator can be made than presented here, I am very interested. 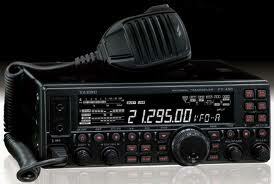 At regular intervals on 518 kHz NAVTEX messages are transmitted by various coast stations. NAVTEX stands for (NAVigational TEXt messages). This radiotelex service transmits navigation and meteo warnings and Search and Rescue messages. 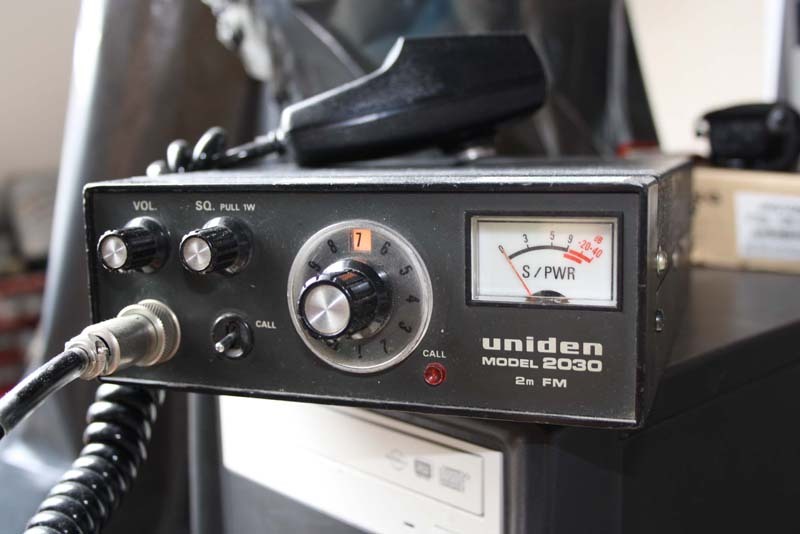 Of course you can use a dedicated NAVTEX receiver but if you have a general receiver that can be tuned to 518 kHz in SSB, than you can receive and decode NAVTEX messages. made of 11 turns of wiring around 4 nails inside the attic roof. 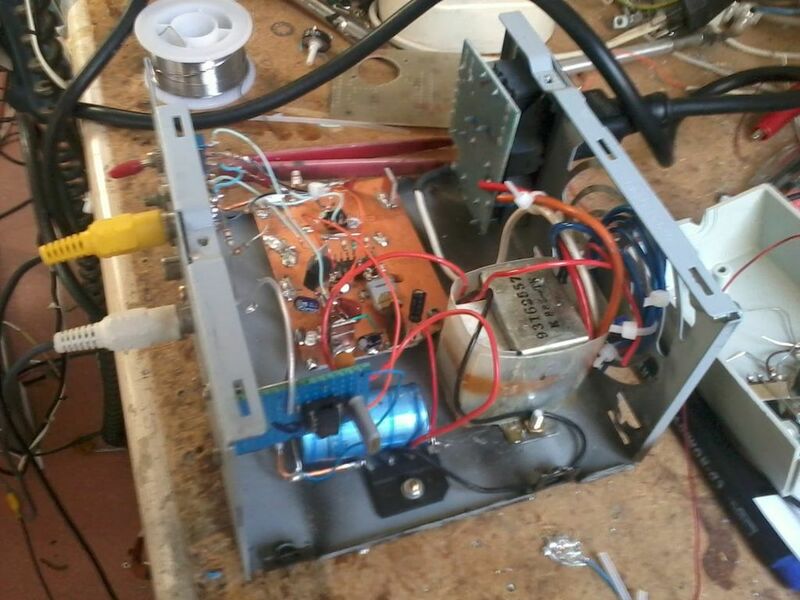 This antenna using a 150 pF variable capacitor is capable of receiving 470-520 kHz (includes the 600 m ham band). NAVTEX uses the AMTOR FEC mode. This code is supported by MultiPSK. 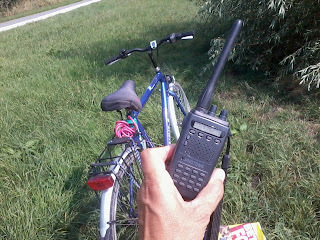 The NAVTEX coast stations not too far from my QTH could be received and decoded (Oostende, Dutch coastguard). In the UK, Grimeton there is also a NAVTEX transmitter. The coaststations transmit in a tight schedule, every 10 minutes another station takes over the transmission. Also, find below the comments of Jan, PA3ABK with tips for additonal software capable of decoding NAVTEX information/signals. The Santa Fe loc started to move by itself (" uncontrolled") and hit the German e-loc " Speisewagen ". 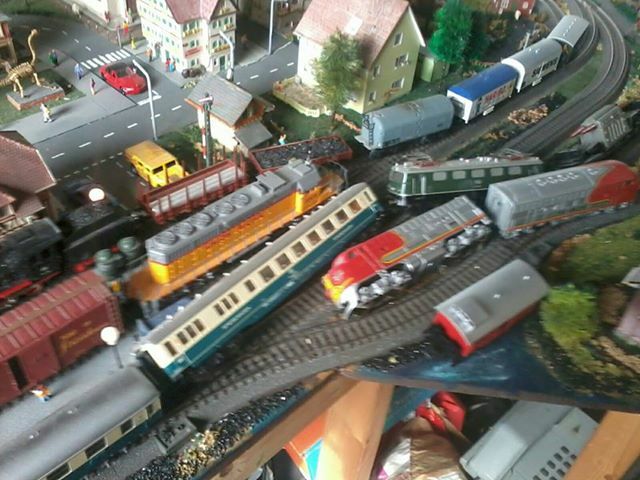 Model trains are another hobby (since I was 6 years old or so..) on which I spend some hours now and then. transmissions with 10 Watts RF possible. to a simple GP antenna. After some CQ's on 145.500 MHz, PA65L from Leiden responded. it was done in the late 70's. The Uniden has a switch to set the output power; you can select 1 or 10 Watts. assures that the PA is switched off when the SWR becomes too high. Think twice before you throw away old consumer electronics. Often they contain a huge amount of nice components to add to your spare part stock. Of course there is a VHF/UHF tuner. Nice part to make your own panorama receiver for example. Furthermore lots of resistors also big ones (> 5 Watts). capacitors in all kind of values (from 20 pF ... 220nF). 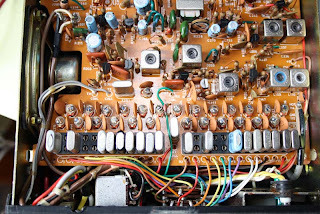 electrolytic capacitors, heat sinks, on-off switch, variable resistors, Japanese transistors (common use and special transistors for video purposes). 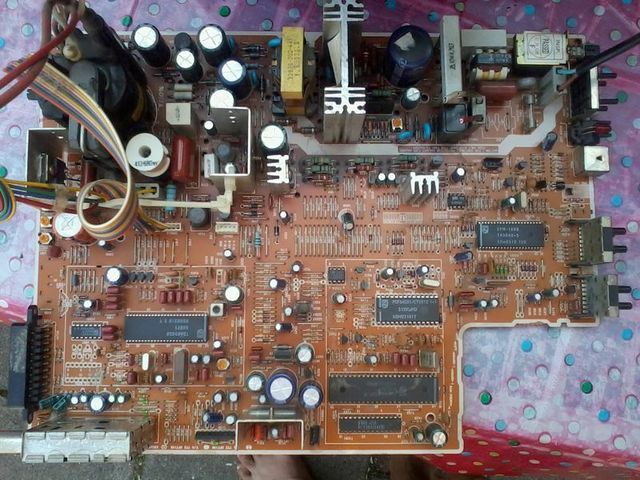 I will not desolder the specialized video ICs and hi voltage transformer (which has collected lots of dust). I am sure I will never use these. Who said our hobby is expensive ? All you need is there free for use :-) And the internet is your best friend when you want the details from an unknown object. 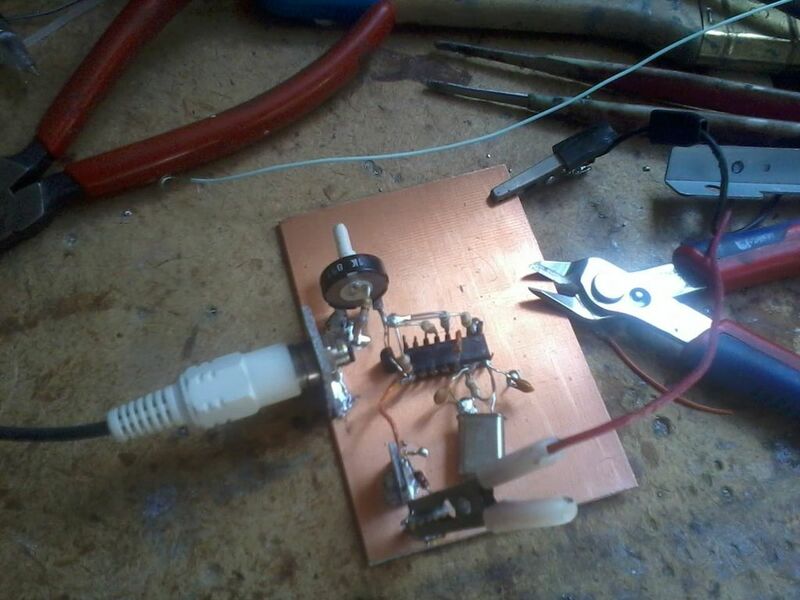 Finally I am ready with the construction of the frequency counter. Found some time to integrate the pre-scaler, stick some labels on the front and assemble the housing. 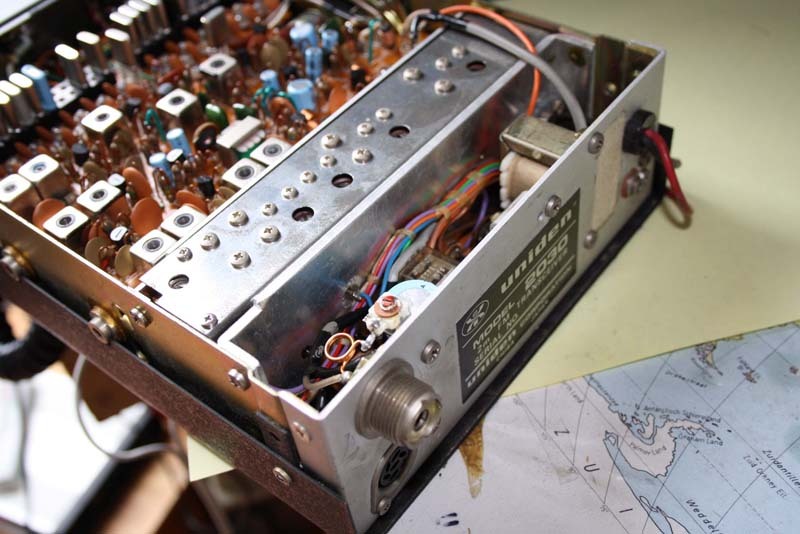 The counter has a BNC and SMA connector as entrance. As you might have read the housing comes from an old PC PSU which I painted gray (front) and black (top). 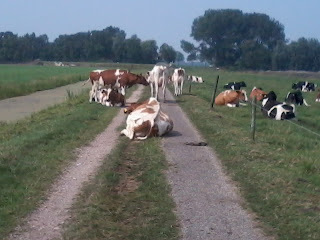 First trials are succesfull. I found the counter is able to measure frequencies in the GHz range. The counter was tested with a QRP ATV transmitter and I saw that it indicated 1.257 GHz, exactly the working frequency of the transmitter. The design of the pre-scaler can be found on my second posting on this blog. The picture above shows the prescaler with MB506 chip on the unetched pcb on the left hand side of the housing. The prescaler is built using the "dead-bug method".